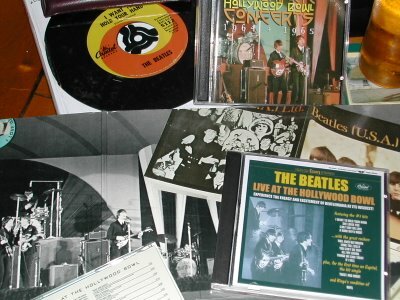 A FEW QUICK NOTES ABOUT THE 1964 HOLLYWOOD BOWL SHOWS! For each of the Beatles' Hollywood Bowl concerts all 18,700 seats were sold. Overly zealous fans(100,000)climbed into the trees surrounding the open air venue to get a glimpse of their heroes. At one point John Lennon ackowledges them by saying "... and welcome to you in the trees". One fan was intent on seeing the show that she was waiting a very long time in the parking lot ... until she eventually gave birth to a son (allegedley midway through the show). Film star Lauren Bacall visited the boys back stage to wish them luck for the evening's performance. The groups set began at approximately 9:30 PM and ended promptly at 10:05 PM. Immediately after the show, the group were whisked away by limousine to a rented mansion nearby. They spent the remainder of the eveing hosting a party which was attened by crew and friends; among them were singer Joan Baez and up-and-coming actress Peggy Lipton.